With contributions by Johannes Brehm, Johannes Döser, Hanno Heymanns, Udo Hock, Joachim Küchenhoff, Rolf Kühn, Jaques Press, Rolf-Peter Warsitz and Uta Zeitzschel. The Question of the Basic Experience of Psychotherapy – Phenomenology of Life in Dialogue with Freud and Lacan. The question of which phenomenology corresponds best to psychoanalysis and depth psychology has been discussed in France since Sartre. Here, it is examined with special reference to Lacan and Henry, two authors representing two radical positions: on one hand the chain of significants of alterity, leaving basically no room for subjectivity; on the other hand the notion of a purely phenomenological life in which subjectivity is founded originally in the living body. The examination draws on Freud who, by describing a distinct phenomenality of affect and instinct (Trieb) independent of phantasy, already knew an autonomous phenomenality of the body which he linked to the unconscious. With regard to therapeutic practice, a bridging is undertaken between these two approaches, and it is shown that the basic therapeutic experience implies a unity of desire and sense (Sinn) in which elements of existential analysis may be integrated in order to do justice to the overall requirement of patients in an increasingly heterogeneous social environment. 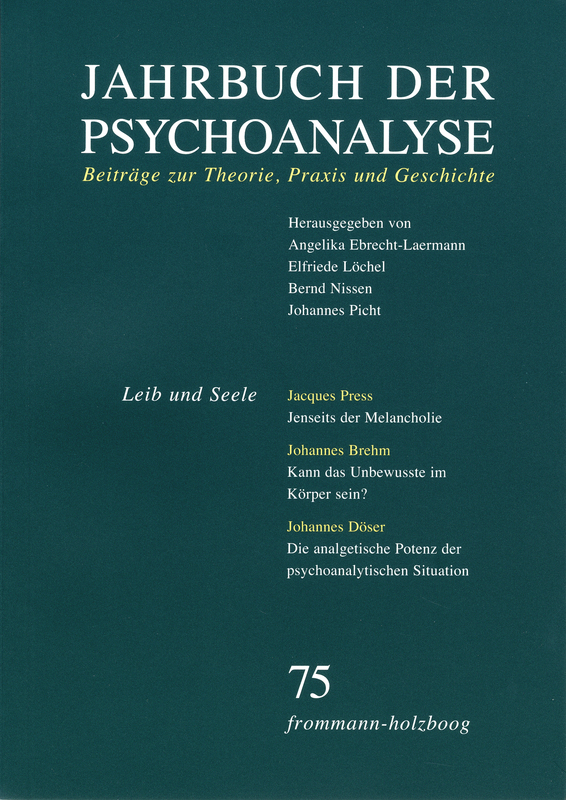 Unconscious and Being: The Relationship between Phenomenology of Life and Psychoanalysis – A Reply to Rolf Kühn. In part one of this commentary Rolf Kühn’s essay »Inquiring into the fundamentals of therapeutic experience« is placed in the wider context of philosophy and psychoanalysis. ›Daseinsanalyse‹ and ›Critical Theory‹ in Germany, the triad of structuralism, poststructuralism and deconstructivism in France are designated as the most important currents of human sciences which influenced and have been influenced by psychoanalysis. In the second part Kühn’s »radicalised phenomenology of life« is analysed focusing on its main concepts (›corporeality‹, ›affectability‹, ›passibility‹). Their reference on Freud and Lacan is traced. In the last part some of Kühn’s central positions are criticised and confronted with Lacan’s and Laplanche’s views on the unconscious. Beyond Melancholia – From »Mourning and Melancholia« to »Fear of Breakdown«. The reflections given here derive from two sources: the author’s clinical experience of oscillations between movements of melancholy and movements of breakdown; and his theoretical view on breakdown as a central psychosomatic crossing point. »Mourning and Melancholy« (Freud 1917e) and »Fear of Breakdown« (Winnicott 1991 ) are submitted to comparative analysis, leading to the hypothesis that melancholy constitutes one of the most tenacious defences against an experience of breakdown. The clinical consequence the author sees from here is the task in each case to advance from the melancholy defense to the underlying breakdown. ›Winterreise‹ – The Psychoanalytic Psychotherapy of an Aged Patient between Depression, Physical and Psychic Frailty, and Beginning Dementia. Using a case presentation, which centers on the theme of separation and on the process of transference/countertransference, the differential diagnosis of and psychodynamics between physical frailty, early dementia and depression are elaborated, and in this respect the interconnection of body and mind is discussed from a specific psychoanalytical perspective. The clinical material illustrates that the long prevailing deficit and defect model – especially of advanced age – currently has been replaced by a more dynamic point of view. It also proves Bion’s statement regarding the onset of senility to which he attributes emotional turbulences as at adolescence. The concept of the contact-barrier, which was introduced by Freud and further elaborated by Bion, proves to be helpful to render the rearrangement of psychomental functioning in old age more comprehensible. In reverse perspective it is also reflected how the psychoanalyst’s advanced age can impair and affect his/her mental functioning as an analyst. Can the Unconscious Be in the Body? The Psychoanalytic Handling of Protomentalized States – A Case Study. In primitive psychosomatic states emotional experiences are not as yet represented symbolically. Instead, they are experienced as states of excitement on a body-mind level, which can only be transformed within object relationships capable of resonance. This paper describes the first eighteen months of analytic treatment of a female patient with various psychosomatic symptoms in order to illustrate the processes of transformation of hitherto unrepresented states of psychosomatic excitement, which initially need to be enacted and realized within the transference. The analytic attitude required for this and the mental conceptualizations are pointed out in the presentation of the clinical material and in subsequent reflection. The paper concludes by elaborating some central aspects of our expanded knowledge of the significance of unrepresented states of excitement in the early processes of exchange between the infant and its primary objects – as they present themselves with regard to questions of technique in the treatment of our patients. The Analgesic Effect of the Psychoanalytical Situation. While the painfulness of the psychoanalytic process is frequently discussed, the analgesic effect of the psychoanalytic situation has so far received little attention. Based on metapsychology and the etiology of physical and mental pain, this paper examines the efforts of the traumatized subject to find regenerative pathways that allow linking up with pretraumatic integrity and help to cope with physical and narcissistic injury. Due to its stimulating effect on phantasy and dream activity, the analytic situation is associated with a significant psychoprosthetic function which limits destructive pain and counteracts the development of chronic pain. Findings from phantom pain- and placeboresearch can provide useful hints for psychoanalysts in the treatment of patients with persistent pain disorders. Riccardo Lombardis Formless Infinity – The Body as a Compass. Riccardo Lombardis book Formless Infinity (2016) is presented. Lombardi discusses the concepts of the unconscious, the role of the body in analysis, the reverie of the analyst, time, and death. He presents numerous clinical examples of working with psychotic patients and conceptualises his work based on theories of Bion and Matte-Blanco. Using a short case vignette, the author concludes with observations regarding the role of the body in analytic treatment. On the Originality of Psychoanalytic Experience. Psychoanalysis has often been criticized to lack an epistemological basis. In this paper we answer this critique by outlining what we call a »dialectical epistemology of psychoanalysis«. In part 1, the impasses in the controversial discussions concerning the epistemological status of psychoanalysis up to now are highlighted. In part 2, we focus on the philosophical foundations of the dialectical concept we propose. We argue for an enlarged concept of language, its foundation in semiotics and its central role for psychoanalytic epistemology. We show that any anthropology or hermeneutics that might serve as a basis for psychoanalysis must consider and integrate negativity, due to the psychoanalytic notion of the unconscious implying different kinds of negative experience. Part 3 describes the dialectical model with respect to basic tools of psychoanalytic perception: The fundamental rules of psychoanalytic practice are extended by the notions of reverie and prosody, allowing integration into a psychoanalytic use of semiotic principles. Part 4 summarizes the central arguments.